It often seems that the choice of furniture is a rather simple thing. But in the store, wandering among a huge number of samples, customers often get lost and, guided only by emotions and visual preferences, make a spontaneous choice, the fallacy of which is realized later, already at home. This also applies to the choice of Living room sofa design, to which it is necessary to approach especially responsibly, since it is in the living room that we spend most of our free time and this room is the “face” of our house. Due to its versatility, the plasterboard room divider allows it to reproduce any design in terms of shape and color for the zoning of a room in a house or apartment, perfectly possessing not only aesthetic but also practical qualities. 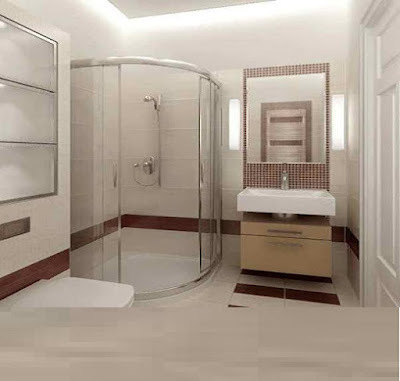 Bathroom renovation is a complex, time-consuming process that requires attention to every detail. The interior of the room should promote relaxation, improve mood, be practical, functional, aesthetic. The traditional way is to finish the bathroom ceramic tiles - you can choose coverage in different price categories, embody any design. It is worth noting the durability of the material - high-quality and properly mounted lining faithfully for many years. 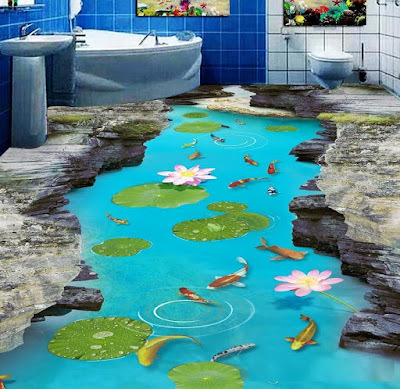 We recently shared: 3D floor tiles for bathroom flooring. 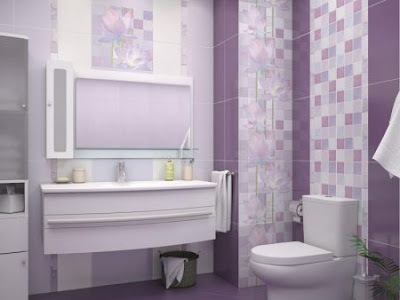 Decorating a bathroom with 3D floor tiles has quickly gained popularity in recent years. Now the 3D bathroom tile, by the degree of distribution, competes confidently with the traditional coating, which is based on tile. Don't miss the most popular guide to 3D flooring: 3D epoxy flooring guide 2019. Modern technologies make it possible to form very realistic spatial images on various surfaces, including those that change with pressure on the coating, which can make a compelling impression on any guest. This is an imitation of a beautiful natural panorama, images of various urban landscapes, or even the feeling of being in the deep sea. The 3D bathroom floor tiles obtained with the help of this tile are liked not only by lovers of new technologies. They attract those people who are committed to a dynamic lifestyle. The furniture industry does not stand still and annually replenishes the market with new collections, as eloquently evidenced by fashionable Living room sofa design. Fashion designers and designers delight consumers with their unique projects. In this article, we will focus on the updates of 2019, which will certainly become popular. we talked about Modern sofa set design in the last article for the corner sofa design was creative and fantasy, which was manifested in the interweaving of different styles, which could be observed in the models. 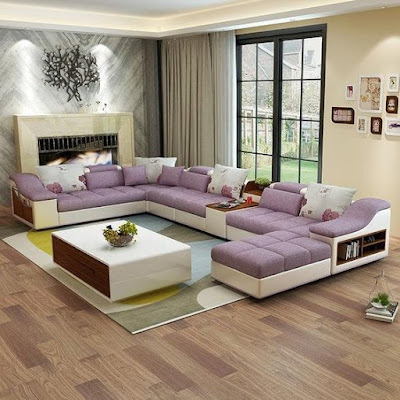 The trends of the Living room sofa design 2019 will be smooth curved lines, all kinds of geometric shapes, finishing materials, natural textures and shades. Fashionable sofas of 2019, photos of which can be seen in the article, are primarily modular models. Despite the seemingly cumbersome, constructions allow us to save usable space. Another remarkable feature of modular sofas is universality: they do not require additional elements, such as couches, poufs , armchairs. frequency and intensity of use. the size of the room in which the sofa will be installed. style design of the room. degree of humidity in the room. 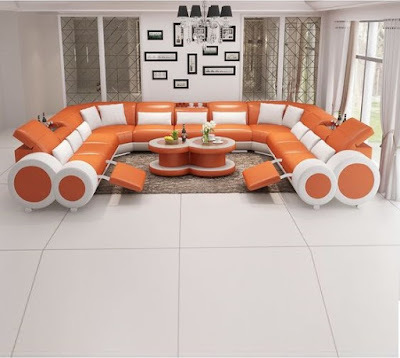 It is difficult to imagine a comfortable interior without a Living room sofa design. 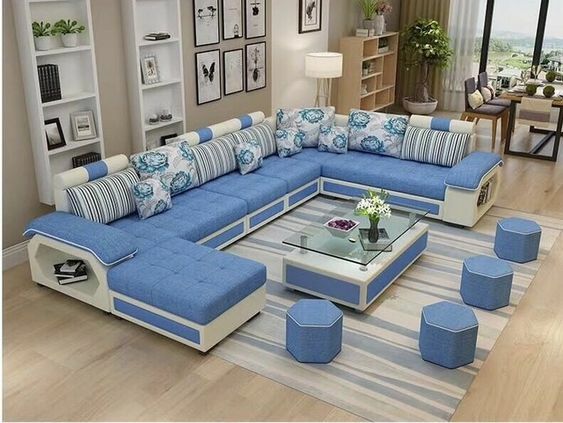 Moreover, the sofa for the owner of an apartment or private house is not only a piece of upholstered furniture for seating for households or guests of the home, but also a sleeping place for one of the family members or friends who have decided to stay overnight. Often, the Modern sofa set design becomes the only piece of furniture in the living room seating area, the focal center of the room, around which the entire design concept is built. 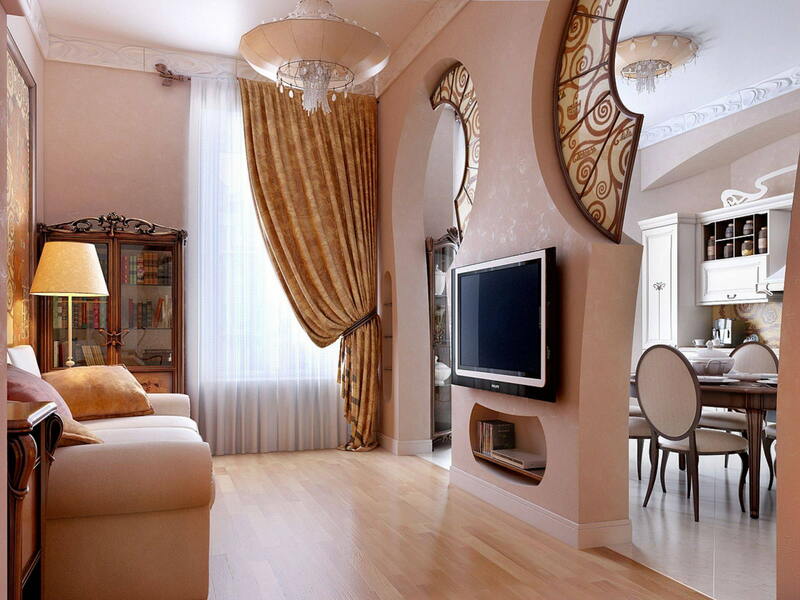 That is why the choice of such an important element of the interior of the living room must be taken seriously. We hope that the design-projects of the common rooms chosen by us, in the design of which there is always a sofa (in one or another modification) will help you decide on the model, color and texture decision. 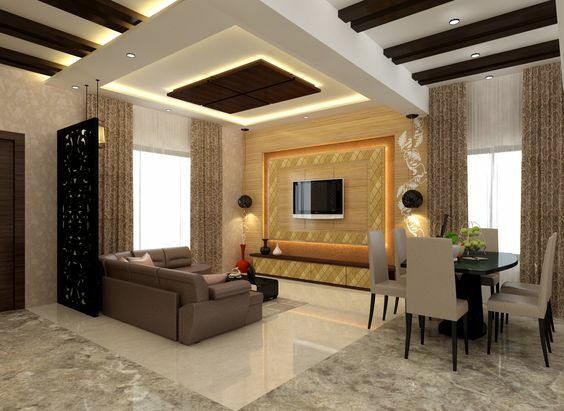 The partition wall design for living room kitchen provides an opportunity, not only to divide the space into functional zones, but also to make it more ergonomic and more convenient. 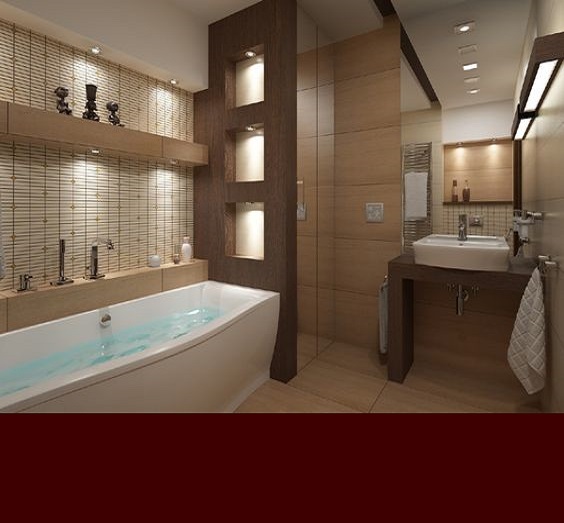 This design of the room, allows you to create the most comfortable and harmonious design. When choosing, you need to take into account the dimensions of the room, the interior concept, as well as the technical characteristics of the partition itself. 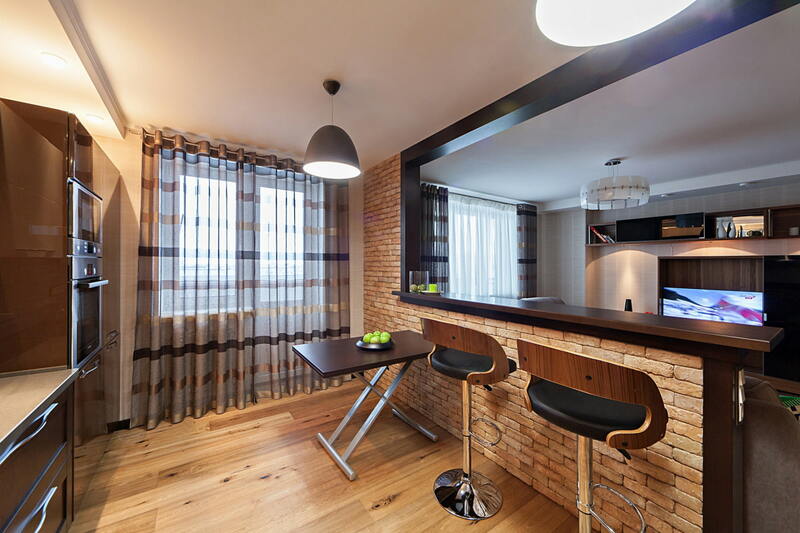 For a small studio in an apartment of the Khrushchev type, do not choose too heavy stationary structures. Choosing the color of the partition, you should take into account in what shades the kitchen set and the whole separation zone are made. A stand connected to a wall or kitchen unit blends harmoniously with the rest of the decor or creates a bright and stylish accent that attracts all the attention. The art Deco Style bedroom interior is able to satisfy the most sophisticated taste and combine the seemingly incompatible: discreet minimalism and luxury. Refined and elegant, this style is suitable for those who demand comfort from the dwelling in the first place and loves open, not cluttered spaces, and those who prefer comfort and bliss of palace chambers with their excesses and decorations. 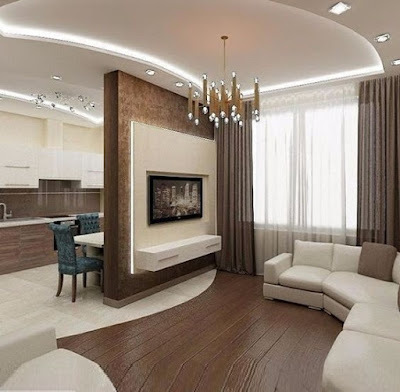 The brown interior design ideas can give the room warmth and make your home truly comfortable - this is what the world's leading designers believe. The variety of its shades is difficult to enumerate. The brown interior color combinations with the other shades of the color palette expands the expressive possibilities of designers. From the point of view of psychologists, brown interior color combinations have a calming effect, relaxes, gives a feeling of comfort and safety. People surrounded by brown note that in such an environment it is easier for them to make difficult, responsible decisions. That is why all tones of brown are chosen by successful, successful people who know well what they need from life and who can receive it. In the apartment or house, each child should have his own corner, ideally - this is a children's room. In the room for children, the child spends a huge amount of time Therefore, it should be beautiful, bright and, of course, comfortable. Create a suitable interior 3D wallpaper design for children room. 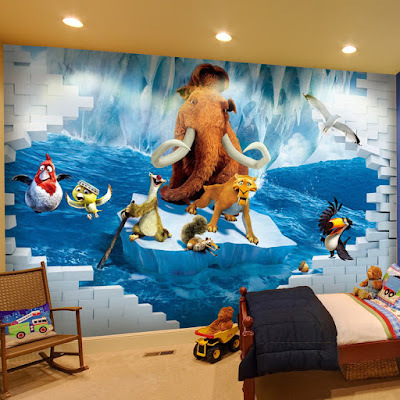 Recently, children's 3D wallpapers design ideas for children room are becoming increasingly popular. This is not only a tribute to fashion, unlike conventional wallpaper, 3D wallpaper design for children room, creating a three-dimensional image, help to develop imagination in children, stimulate them to research and knowledge of the world and create an indescribable cozy atmosphere. Manufacturers of 3D children room wallpapers offer several types of wallpaper that will look different in a room for children. Single 3D wallpaper is a small 3D image, in appearance they resemble a picture, photo or sticker. Most often, the single 3D wallpaper design for children room hangs over a desk, sofa or bed for children and frames them in a frame. Standard 3D wallpaper - are produced as regular wallpaper in rolls. Most often, the standard 3D children room wallpaper design depicts geometric shapes, floral design or abstraction. Standard 3D wallpaper can stick the entire room for girls or boys. They will visually add space to the room, increasing it, or, conversely, can reduce the space in the room. Panoramic or landscape wallpaper 3D - look like a huge canvas. In the room for children they can stick on the wall or on the wall and a half. Most often, the 3D wallpaper design for children room panoramic type depicts a forest or a meadow with flowers. ys and girls to replace standard night-lights. For example, fluorescent photo wallpapers for boys with a picture of a galaxy will help to create an atmosphere of unexpectedness in a room, to stimulate a child to explore and develop fantasy. Choose together with your child children room 3D wallpaper design, "revived" images will help to develop the imagination of your baby. In the room for children with wallpaper 3D child will be happy to play, learn and develop. you can choose a several 3D wallpaper design for children room from our gallery.enjoy watching. 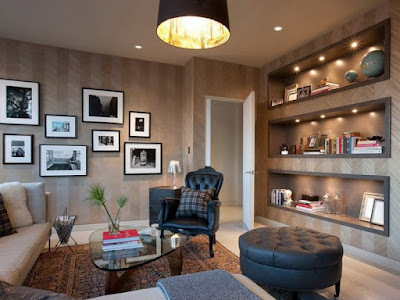 Modern living room makeover, a large room, which is available in any apartment, is a certain business card. According to her judge the owners and make certain conclusions. But what to do if this room is one, because the second room can be a nursery, and combines two functions - the living room and the bedroom. After all, I want to somehow make it so that it is always cozy here and there is enough space for all family members. It is quite possible to make living room makeover ideas, since there are not only building materials that can help with this, but also modern furniture. From the folding sofa can and refuse. It is not required. The closet-bed, which is very convenient, quickly and easily hiding in a special niche, is best suited . Moreover, you can order a corner or radial cupboard, in which there is room for this niche. In such a simple way, a considerable number of meters are released. It is better to choose a multi-functional wardrobe bed. After the bed gets into this niche, a comfortable desk with a rather big tabletop will appear from the bottom. In the afternoon you can work here quietly. The kitchen - the room in which the hearth is located, remains for us the main place in the house. Therefore, it is so important to make it cozy and attractive. 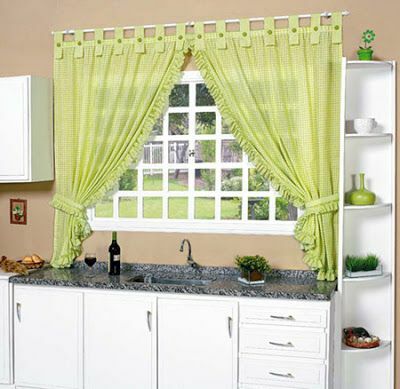 To do this, you have to follow fashionable interior trends, in which the modern curtain designs play an important role. We suggest that you do not stand aside and get acquainted with a selection of photos of new curtain designs for kitchen in 2019. I recommend you to read: Kitchen pop ceiling design catalog. A bedroom more than any other room in a panel house or in a private house requires maximum attention and thought through every detail and every element of the decoration. 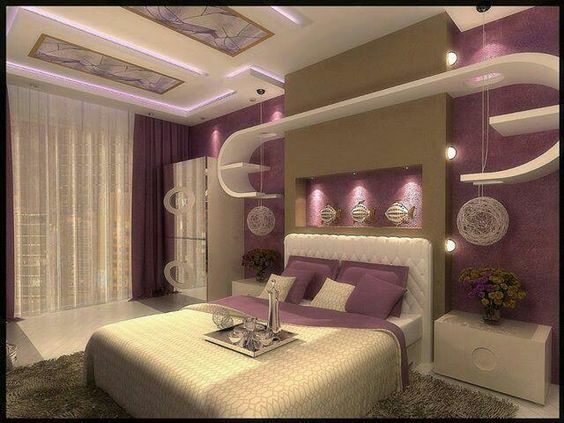 What you should pay attention to, bedroom makeover ideas - is the maximum comfort and convenience. 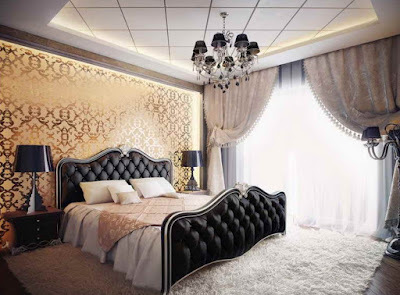 The bedroom makeover ideas today can be incredibly individual and unique. Repairing a bedroom turns it not just into a sleeping room, but into one of the coziest, quiet and favorite places of your apartment or private house. And so there should not be little things. Choosing a bedroom design must take into account not only the external attractiveness, but also its functionality. In small city apartments, a secluded room is used for nightly rest and for storing a large amount of textiles and personal items. The most rational to place all household items will allow space saving bedroom furniture, these unique in its kind furnishings have a special capacity and stylish design. For small bedroom storage ideas, Built-in bedroom furniture is a versatile and quick entry from a difficult situation. Most often compact functional furnishings are made to order. 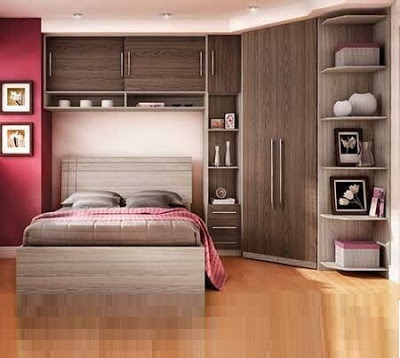 The most popular design solution is the space saving bedroom furniture. The compact design allows you to simultaneously create a spacious place for an evening rest and a roomy storage system for household items. A modern headset is endowed with open side shelves, closet cabinets, large mezzanines.